Seeing art is one thing, but have you smelled it lately? 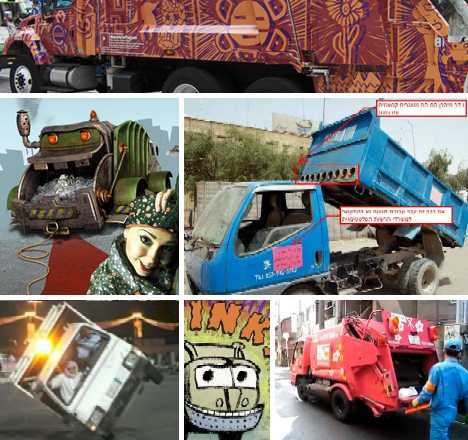 These 11 scent-sational concept garbage trucks trash traditional artistic sensibilities while maintaining the “can”-do spirit today’s waste management demands. You see advertising plastered all over city buses these days, why not city garbage trucks? OK, some advertisers might object to seeing their budget go to waste, so to speak, but not the Discovery Channel! 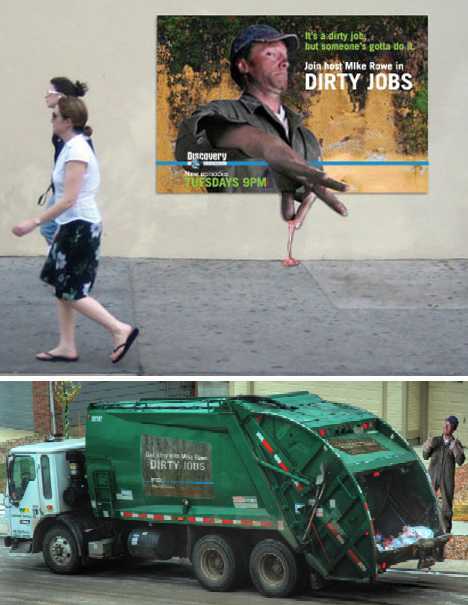 The TV network that hosts “Dirty Jobs” featuring the comedic and non-germaphobic Mike Rowe thought garbage trucks were the ideal medium for hosting a guerrilla ad campaign to promote the show. You might wrap your trash but the City of Brotherly Love does one better: it wraps its garbage trucks. The frillified Philly fleet boasts gorgeous graphics inspired by historic textile patterns. The trucks might still smell bad but they definitely look better. 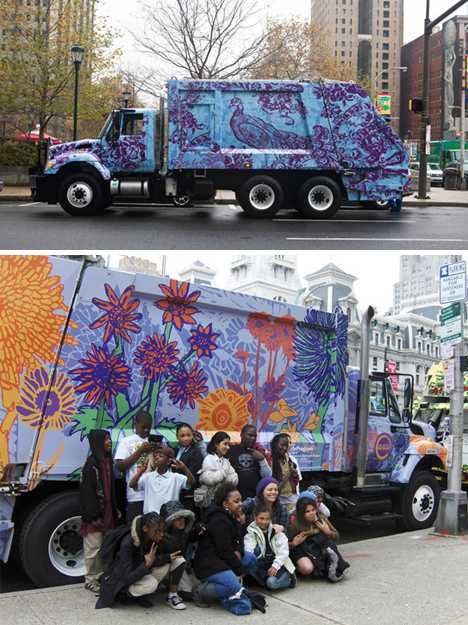 Philadelphia’s garbage truck beautification program got off the ground in the spring of 2009 when city authorities prompted the Mural Arts Program to hook up with The Design Center at Philadelphia University. 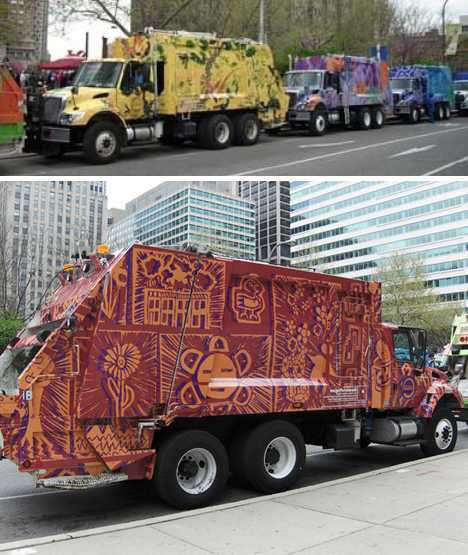 The resulting textile patterns were transferred to mylar and a total of 10 garbage trucks got wrapped. It’s likely that Philly’s program was inspired by the amazing Bonkers Yonkers garbage trucks – a case of imitation being the sincerest form of flattery. This retro-futuristic garbage truck concept by ~stepdesign displays hints of GM’s massive Motorama buses of the 1950s while looking ahead to the practical waste management concerns of today – and tomorrow. 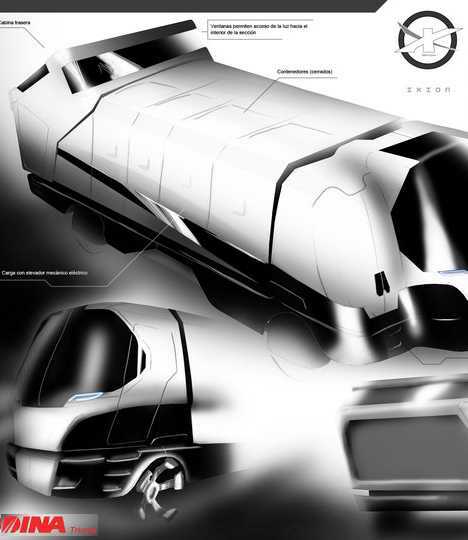 The concept envisions a single driver occupying the front cab, who would be responsible for navigating the truck through urban and suburban living labyrinths. The pick-up crew rides at the very back. As for the trash, it’s stored in capacious clamshell side bins. 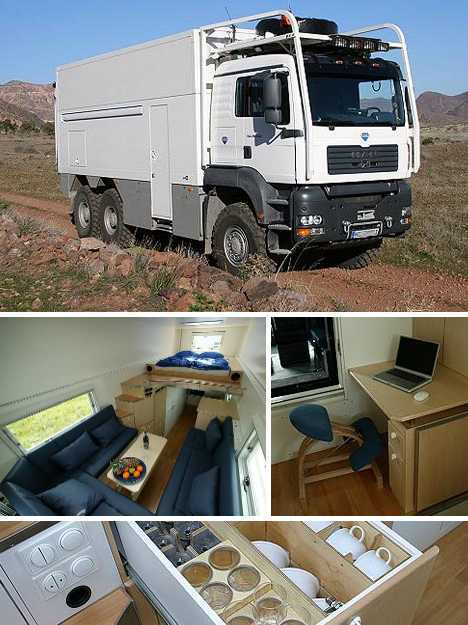 You don’t have to be a real-life Oscar the Grouch to live in a garbage truck… and really, it’s hard not to crack a smile at the sheer wonder inside the Unicat‘s all-business exterior. 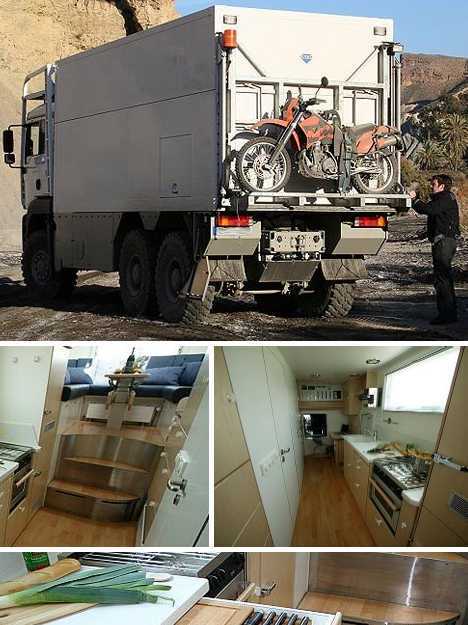 A custom kitchen, hardwood floors and a cozy sectional sofa fit snugly inside the Unicat, providing the driver/homeowner with a veritable palace on wheels with which to navigate post-apocalyptic, zombie-infested highways. Taken a trashy tour of the Big Apple lately? This very rough concept seems to hold out the possibility of seeing New Amsterdam the way its sanitation engineers do – street by street, can by can. We’re not sure why the precarious contraption above was on display in an NYC shop window but give the designer some credit, he/she had the foresight to route the semi-tractor’s exhaust stacks to the rear of the truck… the better to take in the sights, sounds and smells of Olde New Yorke! 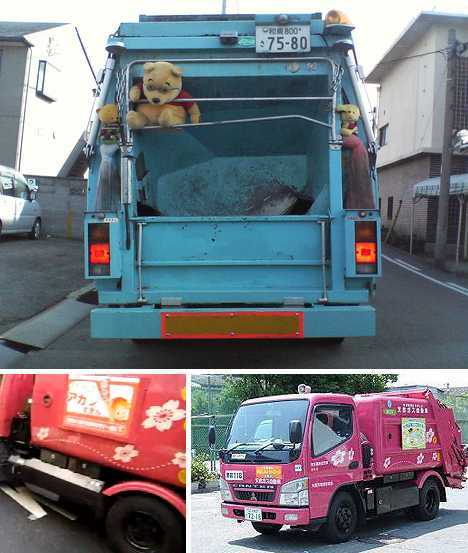 Imagine being a kid in Japan, hungry and overheated on a blistering summer’s day, and what to your wondering ears should appear but those cloying, tinkling, dulcet tones that could only mean… the garbage truck?? Good humor, Osaka waste management trucks don’t haz it. If Thunderdome had a garbage pickup service, Patrick Ehlers’ Garbage Truck would do the picking up – hey, you thought The Toecutter was a neat freak? 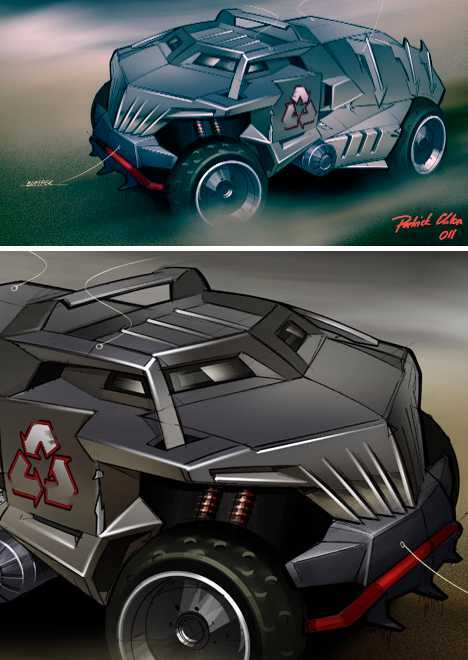 This trash terminator concept was crafted by Ehlers for Sidequesting’s 2011 Dystopia Competition and as a mobile waste grabber, it’s outstanding in a very messy field. 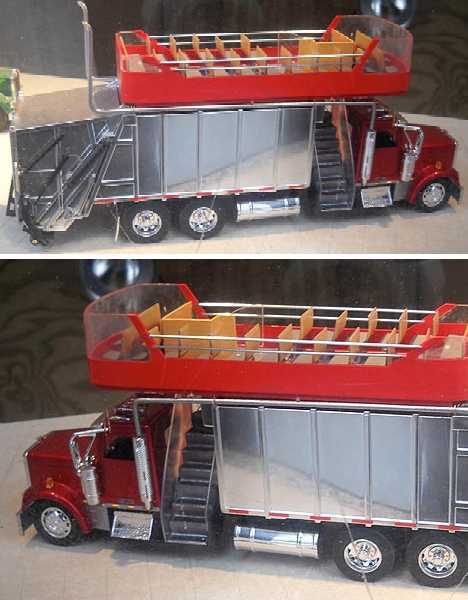 Got a mania for garbage trucks? Then get your trash to Romania and watch Garbage Truck, the Movie… actually “Trei Fratzi de Belea” in Romanian, which translates to “Three Loony Brothers”. IMDB just about blew a sprocket trying to find this 2006 flick but we’re sure it was as big in Bucharest as Ceau?escu’s pompadour. 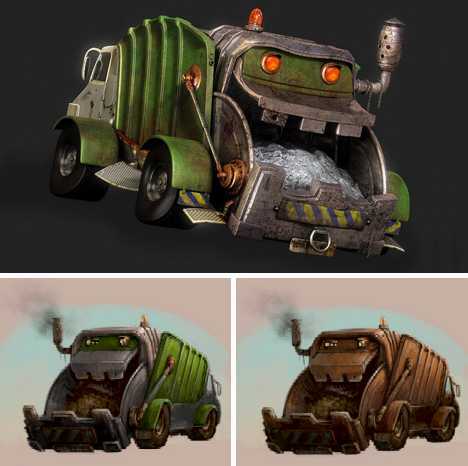 Adrian Lazar‘s concept Garbage Truck art is the true highlight of the film – at least, it’s the only part relevant to today’s topic. Now that’s some mean machine there… with a dash of goofiness tossed in. Just what you want rattling your cans at five in the morning. 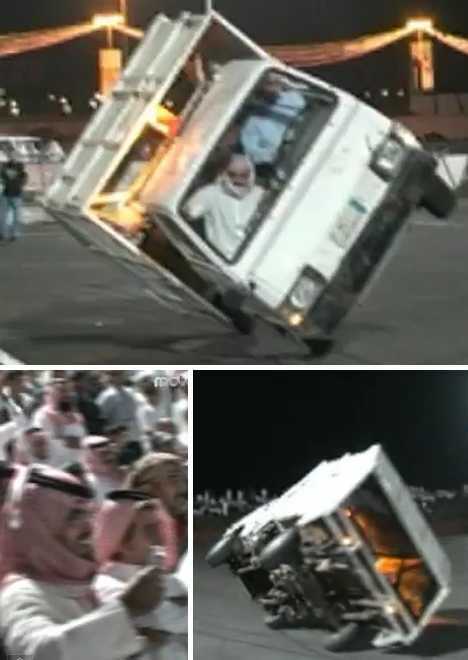 Unfortunately, not all Middle Eastern garbage trucks are deployed for distraction; some have been modified to deal in destruction. 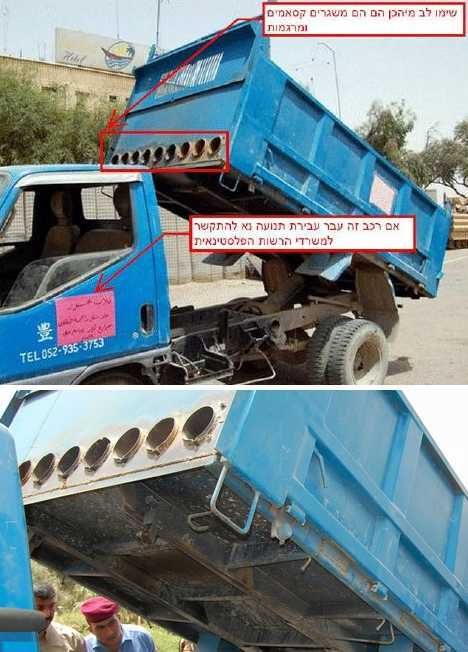 The Gaza garbage truck above was captured by Israeli forces and its “interesting” modifications (to fire up to 9 Qassam rockets) are being displayed. That note on the driver’s door reads “In case of traffic violations, please contact The Palestinian Authority.” Would that be road traffic or air traffic? 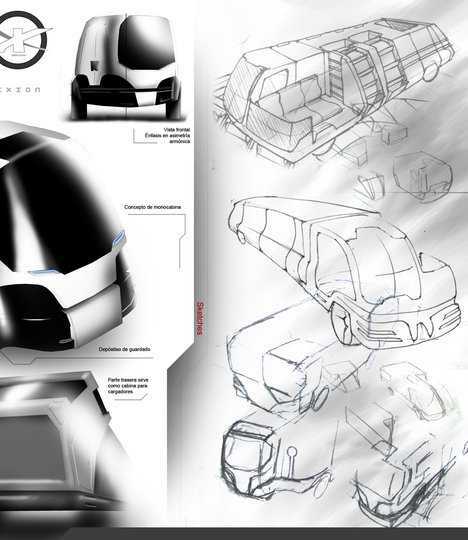 Design student Vaughan Ling’s orbiting garbage truck concept is useful, practical and awesome! 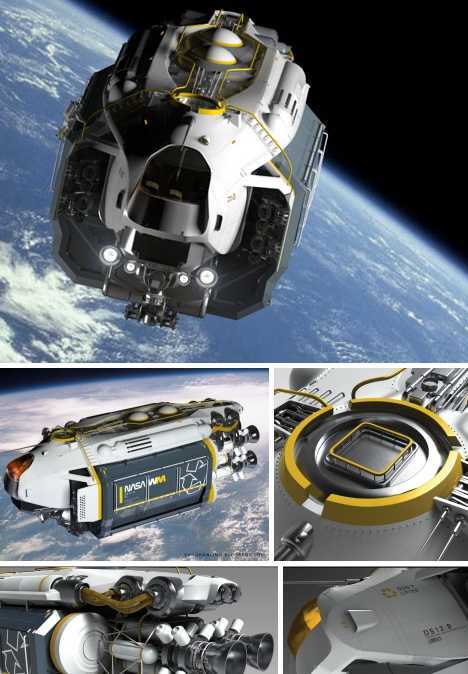 Ling envisions all sorts of space junk being snagged, stored and recycled by this flying one-stop-shop. The latter function involves salvaging valuable rare earth metals from burnt-out satellites. NASA should build and launch this space-sweeper soon… before the orbiting garbage patch over our heads makes it impossible to do so! 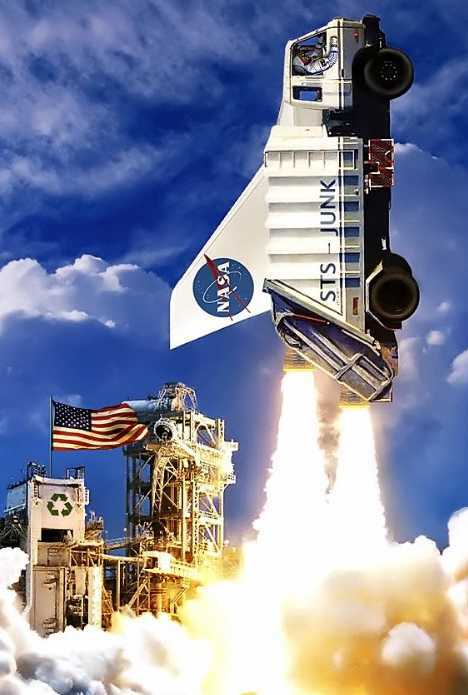 Wherever humans may go, garbage will follow and if the Space Shuttle was America’s “space truck”, then somebody (besides Deep Purple) is going to be space garbage truckin’.